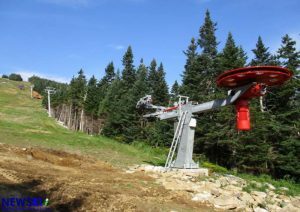 By Shannon Dunfey-Ball, Ski New Hampshire– New Hampshire ski resorts are unveiling new improvements for the 2018/2019 season. The state’s ski areas have been hard at work during the snowless months, revamping everything from their facilities and events to improving snowmaking capabilities. Below is a sampling of ways in which resorts have made the state’s official sport—skiing—even more enjoyable for residents and visitors alike for the upcoming winter. 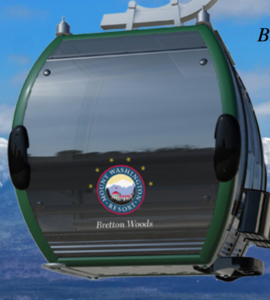 Bretton Woods: Bretton Woods is installing New Hampshire’s first 8-person gondola. The gondola will have 36 cabins, each carrying eight passengers and it’s estimated the 6,000-foot gondola trip will take about five minutes. To follow their progress visit: https://www.brettonwoods.com/Activities/photos_and_cams/Gondola-Photos. Loon Mountain: Boyne Resorts is now the proud new owner of Loon Mountain Resort. The Michigan-based resort company, which had held a long-term lease to operate Loon since 2007, purchased the resort this spring from Ski Resort Holdings, LLC, an affiliate of Oz Real Estate. Included in the transaction were Brighton Resort in Big Cottonwood Canyon near Salt Lake City, Utah; Cypress Mountain in Vancouver, B.C. ; Gatlinburg SkyLift in Gatlinburg, Tennessee; Sugarloaf and Sunday River Resort in Maine; and The Summit at Snoqualmie near Seattle, Washington. Loon expanded the deck of the Paul Bunyan Room by more than 700 square feet. The new deck will give skiers and riders even more room to soak up the sun and enjoy après outdoors this winter. Mount Sunapee: Vail Resorts, the Colorado-based owner of ski areas around North America, is continuing its expansion into New England. Vail Resorts announced that the company has closed on its acquisition of Triple Peaks LLC, the parent company of Okemo Mountain Resort in Vermont, Mount Sunapee Resort in New Hampshire and Crested Butte Mountain Resort in Colorado. Following the closing, Vail Resorts plans to invest $35 million over the next two years across the resorts to continue to elevate the guest experience. Visit www.epicpass.comfor details. Waterville Valley Resort: Last winter construction began on the new High Country T-Bar, and the old 1966 double chair spun for its final season. The newly installed T-Bar’s design is low to the ground, which means no more wind holds and ascent times that are twice as fast, allowing for more skiing and riding on High Country. This summer the Waterville Valley crew was busy laying down 33,000 feet of new snowmaking pipe which connects to 400 new high-efficiency tower and fan guns. They have also relocated 80 snow guns which will allow for better snowmaking in new positions on the mountain. Additionally, they will be adding two new snow groomers including a Prinoth Beast X Winch Cat and a Prinoth 500. The winch cat offers better grooming of steep terrain and will help build terrain parks faster and more efficiently. Waterville Valley has continued the development of their RFID ticketing system. Instead of a traditional lift ticket which is checked by handheld scanners, guests will be issued an RFID card that will be automatically read by the gates. For this winter they have made updates to the technology by improving readability, eliminating the RFID card deposit, and introducing the Direct-to-Lift (DTL) Reloadable Card. Season pass holders and frequent skier card users will also have the option to upgrade to a helmet sticker. A 12,000 square foot expansion to the Base Lodge will allow for better views and more elbow room this season. The installation of glass windows facing the slope allows for more natural light and better views of the mountain. The ski area also added direct access to the mountain from the second floor to the slope for more convenient lift access. The Buckets, Bones & Brews bar is also getting a facelift along with a new name, The Freestyle Lounge. The expansion will also allow for additional seating on the third floor. 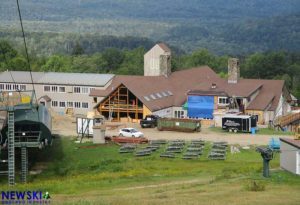 Green Peak is the first major expansion at Waterville Valley in over 30 years. Last winter they were able to open 7 of 10 new trails, but for the 2018/19 seasonthey will be unveiling the final three trails which have not yet been skied, including Wayne Wong Way, which features the steepest pitch at the resort. In 1969 Waterville Valley formed the first freestyle instruction program, making the resort the birthplace of freestyle skiing. The following year resort founder, Tom Corcoran, and editor of Skiing Magazine, Doug Pfeiffer, organized the first National Open Championships of Freestyle Skiing on the Sunnyside trails. For the 2018/19 season, they will continue their tradition of bringing world-class events to the slopes of Waterville Valley. The Toyota Revolution Tour event will return on January 13-18th as well as the World Pro Ski Tour February 8th & 9th. Finally, the much anticipated U.S. Alpine National Championships on March 23-26 will bring the nation’s top ski racers to Waterville Valley. Cannon Mountain: This year Cannon spent $180,000 to make aerial tramway upgrades, plus an additional $180,000 for upgrades on other chairlifts. This year the ski area invested $350,000 in a new Prinoth Grooming Machine and $90,000 in snowmaking upgrades. Cannon made $450,000 in food service upgrades, including an addition to the Cannonball pub which will add up to 80 new seats. Cannon built a brand new ski patrol hut on the mountain summit and spent $180,000 on installing a new fiber optic line. Great Glen Trails: The new Glen House Hotel opened in the Fall of 2018 and now provides trailside lodging at Great Glen Trails. This eco-friendly hotel continues the long history of lodging in the Great Glen, dating back to the first Glen House in 1853. The hotel houses 68 rooms facing mountains on both sides and includes an indoor pool; the Notch Grille restaurant serves breakfast, lunch, and dinner and has a full bar. This year, the resort has invested over $300,000 on a new PistenBully 400 groomer set up specifically for Nordic grooming. Work has begun on building a new Guest Services area in what was known as the Discovery Center. This will relocate all of the ticketing, season pass pick-up, lodging reservations and check-in, and general information into a streamlined space. Pats Peak: Has purchased a new compressor that will boost the air plant by an impressive 20%, allowing even more snow guns to run at warmer temperatures. Pats Peak continues to increase their snowmaking capabilities by adding to an arsenal that already gives the mountain 100% snow coverage. This season four new fans from SMI Snowmakers and 20 new towers will greet customers. The center A-frame that makes up the main base lodge will be under construction this season with work being done on the foundation and the underground utilities. The lodge will also be expanded and will feature an all-new post and beam entrance, brand new bathrooms, an elevator, and additional seating. Pats Peak’s new Elan rental inventory features comfortable boots and some of the most cutting-edge ski technology that Elan has ever produced. The 9,600 square foot Starting Gate Rental Shop is Northern New England’s largest rental shop. An upgraded powerline will deliver power to the snow guns like never before, allowing for more water to be converted faster and more efficiently. McIntyre Ski Area: McIntyre has improved their snowmaking capabilities by adding a new HKD snow gun to the resort, purchased a new fleet of rental skis, boots, and new service tuning equipment. McIntyre has made improvements to its parking lot lighting and acquired a new 2018 New Holland tractor. It is also finishing building a new website. King Pine Ski Area: This fall, King Pine continues working to maintain, improve and further expand its tree skiing areas within its existing boundary area and is planning another Saturday volunteer work day in late October similar to a successful and productive volunteer work day held the previous year. Ski New Hampshire is the statewide association representing 34 alpine and cross-country resorts in New Hampshire. For more information on ski areas, trail conditions, vacation planning, and updated winter events at Ski New Hampshire resorts, visit SkiNH.com.For statewide travel info, go to VisitNH.gov.